Public Folders, launched with the initial version of Microsoft Exchange, are designed to provide organizations with a simple and effective way to collect, organize, and share information within workgroups or the entire organization. Such folders follow an organized hierarchy and they can be replicated between servers running Exchange. The most interesting aspect of Public Folders is that they are stored in dedicated databases called Public Folder Databases. And like all data on the Exchange Server, the data within Public Folders is stored within EDB files (.edb). Public Folder Databases store a lot of critical information and hence, if such databases are subjected to any disaster like accidental deletion from the .edb file, data worth a lot of money and legal importance stands threatened. As such, all organizations using such dedicated databases should follow the fundamental rule of backing up. Taking backups might seem like a tedious and unnecessarily lengthy procedure but no one can predict when a backup will need to prove its worth. So it’s always better to be safe than sorry. Consider a situation where an Exchange administrator accidentally deletes all the public folders from a Public Folder Database. Accidental deletion of one or all public folders can affect some other task on the database that contains them. If such a situation arises, sooner or later you’ll have to come to terms with the painful fact that a deleted public folder cannot be simply restored through an older version of the public folder database. Even if you restore the database from a backup, the public folders will be visible only till the server receives replication messages. Since the folders have actually been deleted from the public folder hierarchy, as soon as the public folder database receives a hierarchy update, it will come to know that the deleted folders don’t exist within the hierarchy and they will be deleted again by the store. So how to restore accidentally deleted Public Folder Database from .edb file in the easiest manner that allows the folders to actually be recovered? Launch the Exchange Management Console and navigate to Microsoft Exchange > Server Configuration > Mailbox. You’ll find the “Server list” in the center. Select the Server on which the database you’re recovering resides. At the bottom you’ll find a check box that says “This database can be overwritten by a restore” select it and click apply. Now navigate to the directory in windows explorer where you have restored the exchange database and find the public folder database. Rename the original database to something through which you can instantly recognize that it is the original one. Finally select re-mount in the Exchange Management Console. Repair the database by running the command “eseutil -p <PFD name>.edb”. Note: Replace <PFD name> with the name of your public folder database file name. After this you can mount the public folder database using the Exchange Management Console and follow the remaining steps. Though the above procedure works, it involves too many steps and is somewhat complicated to work with. There is another way (using prominent software) to restore deleted Public Folder Database from .edb file and that too much more easily and without any glitches; this utility is Stellar Converter for EDB. So why go through with the headache of a procedure that’s difficult to understand and follow when you can simply automate the entire process and be worry-free! Agree with the above helpful, but need a quick resolution. Does that tool also support corrupt edb file in case of restoring a deleted public folder from that damaged file? Hello Andy, for recovering data (accidentally deleted public folder) from corrupt edb file; try out our Stellar Phoenix Mailbox Exchange Recovery software (http://www.stellarservertools.com/recover-exchange-mailbox.php). Using this tool, you can recover almost every piece of data (including data from public folders) from corrupt Exchange .edb file. Download the demo version to check the features of our most prominent tool, and activate the software to restore public folder data. Please note, our EDB to PST Converter tool only works if .edb file is not corrupt. Exchange database or EDB file is the information store of Microsoft exchange server. Like any database, the EDB file is also prone to errors arising due to a variety of factors and this can put all the valuable information inside the EDB in jeopardy. Then there are common Exchange errors codes like 528 and JET engine errors that often confuse exchange admins and hinder workflow. 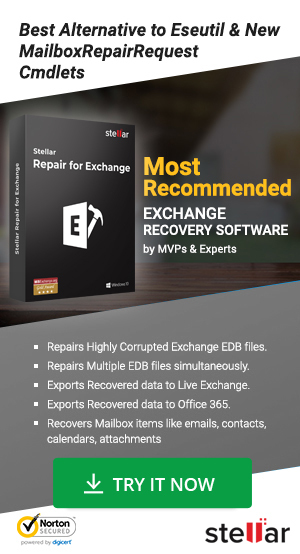 But fear not as gone are the days when an exchange admin faced with such situations had to be content with partial data recovery using native tools as new gen utilities Stellar Converter for EDB can flawlessly recover all the information from exchange database for you. Most exchange admins know that Outlook PST is a more manageable file format as its generally used for archiving mailboxes. Thus you can safely recover all your data from exchange database and convert it to PST no matter what state it is in using Stellar. Your satisfaction is a matter of pride for us.